Just in time to dampen gamers' holiday spirits (in a good way! ), Limbo is finally coming to Macs everywhere. Playdead's Limbo was the game that surprised everyone when it was released two summers ago. You know, because it was one of the best games of the year. While initially only available on the Xbox, developer Playdead has gradually been working on bringing the title to other platforms. Earlier this year, the game came to the PSN (where it became the top indie title of 2011) - now it's available for the Mac. 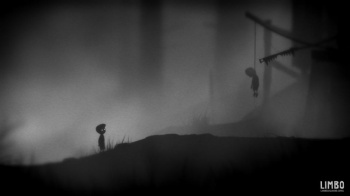 It turns out that Limbo is already available on the Mac App Store. It launched today and is selling for $9.99. It's also set to arrive on Steam (for the Mac) on January 13th. Seeing as how the game is only 83 MB, it'll be interesting to see if Playdead is planning to bring Limbo to any other platforms like smartphones and Google Chrome. Seeing as how Chrome is capable of running Mini Ninjas and iOS devices can play Grand Theft Auto III, this seems like a definite possibility.